My daughter has a fascination for balloons. Don't all kids? Anyway, she got a balloon from McDonald's and has been holding it almost the whole day long. This morning as we were going for a walk, she refused to let go of her balloon, so I had no choice but to let her hold on to it. We went into the elevator and there was a lady who greeted us. Initially she did not realize that my daughter was carrying a balloon. When she finally did, she moved away quickly. I thought she was afraid the balloon would dirty her lovely dress. But she stepped towards the door quickly and said, "Sorry, I'm afraid of balloons." I apologized to her and tried to stop my daughter from waving it at her. I managed to get control of the balloon although my daughter wants to swing it back and forth. The poor lady was already facing the door, refusing the turn behind to look. She was waiting for the door to open to rush out. Unfortunately the elevator stopped at another floor. She was all ready to flee, but was forced to stay in the elevator for another minute or two, before we finally arrived at the ground floor. She said another Sorry and ran out. Probably she was trying to say sorry she could not hold the door for me and my daughter in a stroller. Hmm.. I was so sorry for the lady. I began to wonder if there are any of you who has fear of balloons or any other ordinary items. Many fear animals and creatures, but never thought that balloons would make someone afraid. I believe she's afraid it might pop. What are some of your fears? This is the first time I heard of balloon phobia as well. But I wouldn't be surprise. There are so many people in this world with fears. And there are so many things to be afraid of. I wonder what happened in her life that made her so afraid of balloons? Hi ah gong, I really wonder about that too. But I don't think she was in any mood to have small talk. I can imagine the tense mood in the lift. At the sight of the balloon, she is already inching towards the door. Cannot imagine if your child were to wave the balloon at her, what would she do? Probably do a spiderman and start climbing the lift walls. Oh no, what if the balloon pops? She will probably bang right thru the door and the wall. Much like one of those comic scene you see on TV, where her silhouette can be seen on the door and the wall! hi positiveminded, There are many strange phobias we may not be aware of. I know that some kids may be afraid of balloons popping, but I supposed she has let her phobia reach adulthood. I'm afraid of enclosed areas too, but not too bad. I can still get into a lift, but I can't imagine if the lift breaks down. I will scream!!! i have heard of people being scared of cotton and other such items... myself im scared of bugs... roaches are frightening to me but more of a gross factor there but am absolutely terrified... don't laugh too hard now... of ladybugs... i rather play with a lizard, try and befriend a stray cat... go bungee jumping rather than be near a ladybug... i cringed just now =P one time i was in a computer lab at college and i don't know from where it came but a ladybug landed on me a girl next to me said ohh how cute a ladybug.. i jumped up and realllly tried my best not to scream but i think a muffled one out of my tightly closed lips did escape as i was pounding away at my arms... i realized everyone was looking at me and the girl was looking at me as if i was mad she's like... i think it is gone after all that... i sat back down saved my work and left the computer red sooo embarrassed! HI nadooa, Ladybugs are one of the friendliest bugs around. BUt becareful, it may get into your ears. Happen to my aunt when she was young. Had to go to the doctors to get it extracted. I have other bugs of course. Roaches and lizards are horrid. I still can catch roaches with a bag but lizard, no way. About your experience with it, sometimes when we are afraid of something, the more you experience it. I guess it's God's way to help us overcome it if we try. Haha! But doesn't work for me. Hi sydney! That is very interesting! I guess she was frightened somehow when she was a child. Maybe one popped in her face or something. I never knew anyone who was afraid of a balloon. My cats even love them! They grabbed the string when I got two of them for my graduation from rehab and where dragging them around the house! What I am afraid of is dolls and clowns! Those are very real phobias. I was reading about them online not too long ago. There are alot of people who are deathly afraid of dolls and clowns. I forgot the names of the two phobias. When I was a kid I would think my dolls where moving around at night and trying to scare me. I read about a woman who felt the same way. And alot of people are afraid of clowns for some reason. That is a really big phobia. You would think that people really love clowns, but they all don't. I have always hated them and I have no idea why. Hi Opal, Thank you for dropping by my discussion. Fear of balloons are as real as fear of dolls and clowns. I have seen children crying when they get close to clowns before, so I guess they can be frightened by how they look, pretty unnatural. As for dolls, I guess you won't like to watch Chucky in the movies. My mum used to scare me that dolls can walk around at night too, but so far I am not afraid of it. I'm afraid of small confined spaces. Lifts are still okay for me, but I can't be there for long. I know that there's ventilation. But if there is a jam and there's no ventilation, I can't imagine. Thanks for responding! Hi Princess Kitten I know it's hilarious. I couldn't help but giggle a little when the lady told me that she was afraid of balloons. But I knew she was serious about it and stopped immediately. And with my daughter trying to wave it at her, I was afraid she might scream. I can see that she was trying to hold a scream back. Thank you for your response! Oh wow...I've never heard of that before. Maybe she had a terrible experience about balloons when she was a kid that's why she fears them. I'm scared of snakes and anything that crawls. Hi Shar, Yup! I guess so. I'm afraid of snakes and creepy crawlies too. But I always try to confront these fears. As for snakes, I'm afraid that they will bite me. If they are slower moving ones, I can touch them without fear, but if they are fast like the green tree snakes, I don't dare to touch them. Sometimes I'm forced to catch creepy crawlies that come into the house. If my hubby is around, of course I'd ask him, but if I'm alone, I have to do it myself. I usually use a plastic bag or tissue to do this, never with my bare hands though. Thank you for your reply. I really have the fear of heights but as much as possible, I am exposing and forcing myself to it just a way of confronting the fear head on. I dreamed to do sky diving in the future just to vanish this fear. Hi mjmlagat, I have a fear of heights too. Many people are as well. You are brave. Even though I'm afraid of heights, I still take roller coasters and other fun rides at the fair. Strange but I don't feel afraid if I feel secure. But not when I have to climb up to a great height, that's when I will quiver. Thank you for responding! That is not surprising, as people have phobias about everything. Maybe she had an incident with one as a child. How sad to be afraid of balloons. They are everywhere!! My daughter's ex boyfriend was afraid of monkeys, for some odd reason, even toy ones. HI nanajanet, Talking about balloons being everywhere, I wonder how she handles parties. There's bound to be one with lots of balloons? Thank you for the response! I have never heard of a fear of balloons but i guess it doesnt surprise me..i mean people are afraid of clowns even friendly looking ones, and there was someone on Deal or No Deal that was afraid of Big Bird, so i guess its not as strange as it sounds..lol My big fear is heights, i cant even stand on a step stool, cuz im afraid i will fall and i get all shaky..yes i know its not a far fall..lol but i still cant do it. 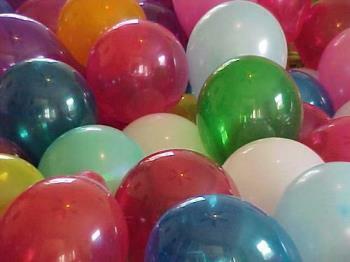 Hi faln angel, I have been trying too locate the terminology for ballon phobias, but can't find any. It would be funny to Big Birdy-phobic or clownophobic. LOL! Ballonaphobia does not sound to bad. Many people are afraid of heights. I am too. My dad isn't. He lives on the 15 th floor of his apartment and there was once when he climbs out on the ledge to clean the windows! I was so furious that he did that and warned him not to do it again because it is so dangerous. He used to climb up high at his previous job. Writing about this already gives me the jitters. I can feel it all over my hands and feet. Thanks for the response! Hello SydneyHazelton, I have a balloon phobia too but not as serious as the lady you mentioned here. Whenever I see a person giving away balloons for kids, I will try to distract my son from it. I don't want him to have one cause I am afraid that the balloon might just pop! One time, I was driving and my son was holding on to his balloon when out of sudden the balloon popped and made me stepped on the brake immediately. Lucky I was slow that time and there was not many cars. Hi SydneyHazelton, I believe there might me a reason the lady you met having the balloon phobia. Here I would like to share with you the balloon phobia story of my friend’s daughter. The daughter of one of my friends likes balloon very much. This lovely kid is very good in blowing balloon. She is an enthusiastic and helpful little girl and likes to help her parents and friends to blow balloons of different colors to decorate the house before the celebration of birthday or festive season. Once the inflated big balloon of a guy, standing right in front of her, was blowing burst in a sudden and a piece of chip from the burst balloon heat tough on her left eye. She felt the great pain on her eye lid. She screamed and cries desperately and thought that she would be blinded then. Luckily that only the outer part of her eyes was injured. Since then she never ever wanted to blow balloon anymore and would stay far away from balloon if she comes across anyone holding or blowing balloon around. Unfortunately she has developed a phobia balloon eventually. posting and take care.